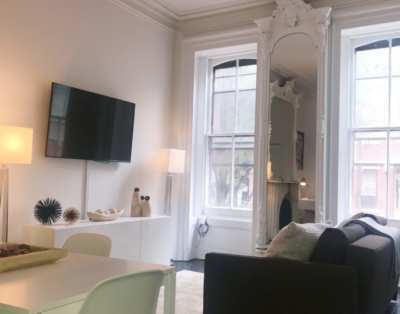 Beautifully Furnished 1 BR One Block from Union Sq. Attractively fully furnished 1 large bedroom, living room has a full size Sofa bad have HD TV’s with working cable, Large living room and just renovated bathroom finishes. .The unit comes fully prepared with High definition cable TV , WiFi, linens, towels, dining & cookware, and professional cleaning service so you can seamlessly assimilate into your new home environment.Looks exactly like the photos!! Located in exciting, central, and very safe location on 14th Street off 3rd Ave. walk to Trader Joe’s; across the street there’s Whole Foods; Food Emporium, Dry Cleaners, Starbucks and Subway station downstairs (4, 5, 6, N. Q, R, L)fully furnished* and rarely available!